The LINE-X equipment is a high pressure heated system. The equipment pressurises the liquid components and heats them, separately. Then through heated hoses, the material is brought together at the very tip of the gun. If you provide the workshop, we’ll provide the necessary equipment, training and support that will put you in business today! 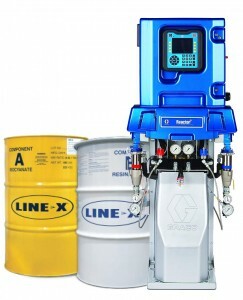 Our LINE-X package includes the speciality equipment necessary to run a successful business. The gun is very simple to use. Just trigger the gun and it sprays! Let go of the trigger and it stops. There is no flushing or purging of the lines or gun because the materials are kept separate. It’s like a flexible plastic coating, but spray applied, far tougher than most other protective coatings and has a quick set time. 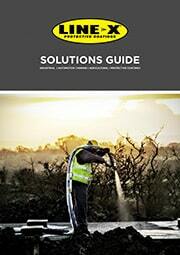 LINE-X can be sprayed at any desired thickness, from 1mm to 10mm and beyond. LINE-X exhibits one of the highest tensile strength’s, one of the highest tear strength’s, and one of the highest abrasion resistance than most other spray-on coatings available. This makes LINE-X one of the highest performing protective coatings across the automotive and industrial industries. LINE-X is a two part polyurethane elastomer system. It uses equal parts of an “A” component or hardener and a “B” component or resin. When combined properly it produces a polyurethane elastomer similar to the bottoms of your work boot. The two liquid components are brought together (using special equipment) at the tip of the spray gun. LINE-X cures or “sets up” in 3 to 5 seconds, giving it an immediate set time. For an idea of application time it takes about 3 hours for one experienced person to complete an over the rail truck application. This includes the masking and the preparation of the surface. The truck is ready for immediate use, even in the rain or cold, without affecting the material.